Black Lives Matter (BLM) co-founder Patrisse Cullors along with co-founders for Toronto chapter – Rodney Diverlus and Longbeach chapter Dawn Modkins were in Sydney to accept the Sydney Peace Prize on the 2nd November at the Sydney Town Hall. The Sydney Peace Prize citation explains the prize is worthy in light of a global recognition in building a powerful movement for racial equality, courageously reigniting a global conversation around state violence and racism. And for harnessing the potential of new platforms and power of people to inspire a bold movement for change at a time when peace is threatened by growing inequality and injustice. As apart of the BLM community engagement whilst in Sydney, the entourage experienced a deep and profound insight to some of the social justice issues affecting Aboriginal, Torres Strait Islander and Australian South Sea Islander (ASSI) peoples. 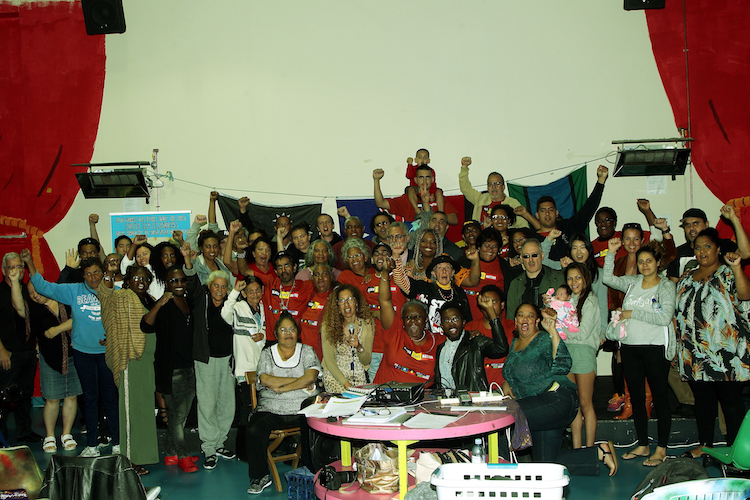 Australian South Sea Islanders (Port Jackson) as the coordinating body hosted the Black Lives Matter yarning circle at The Settlement in Redfern on the 31st October. The BLM founders listened to families that travelled some ten hours to share their frustrations and loss of loved ones to ‘Black Murders in Custody’. The families were Chatfield (2017), Whittaker )(2017), Dungay (2015)Murray (1981) and Scott (1984). Lola Forester facilitated the talks due to her long-standing relationship and bond with the families through reporting their atrocities as the face of the Blackchat national hour on Indigenous radio. Guest speakers were the mothers and families of loved ones who died in custody, Nathan Moran CEO of the Metropolitan Local Aboriginal Land Council, Ken Canning Indigenous Social Justice Association and long-term activist, Professor Gracelyn Smallwood -James Cook University and 50 years activist, Levitt and Robinson Lawyers as well as Emelda Davis president of ASSIPJ who reiterated the need to work together. The night saw a diverse representation in the room for the black on black talks such as Indigenous, African, West Indian, Asian and African American’s pledging their ongoing support for social justice against people of colour. Conversations were confronting, emotional and very raw however this was the first time for these five families connected in a forum of this nature that allowed them to share intimate and heart-wrenching experiences with the audiences but specifically Black Lives Matter founders. Positives that came of this historical event were that the families were provided with a safe space supported by families as some emotions were overwhelming but seen as a sense of relief in being heard on a trusted platform in sharing with the mob. We all listened and grieved then talked about strategies of connectedness, pathways and what support look’s like as we build on this movement. Professor Gracelyn Smallwood, in particular, spoke in support of the families and touched on the Palm Island riot case recent success and class action along with suggestions of legal pathways for the families. Black Lives Matter founder Alicia Garza sent through words of solidarity and co-founder Patrisse Cullors and the BLM chapter representatives Rodney and Dawn shared words of acknowledgement of country, great appreciation and entrusted that stories would be shared and honoured in the USA. There were insights into the parallels in the USA and recent struggles of African Americans and beyond along with words of wisdom around self-care and the importance of rechanneling the energy of frustration into self-determination to fuel the plight o our peoples. Images by Barbara McGrady. This article first appeared in the First Nations Telegraph on 7 November 2017.